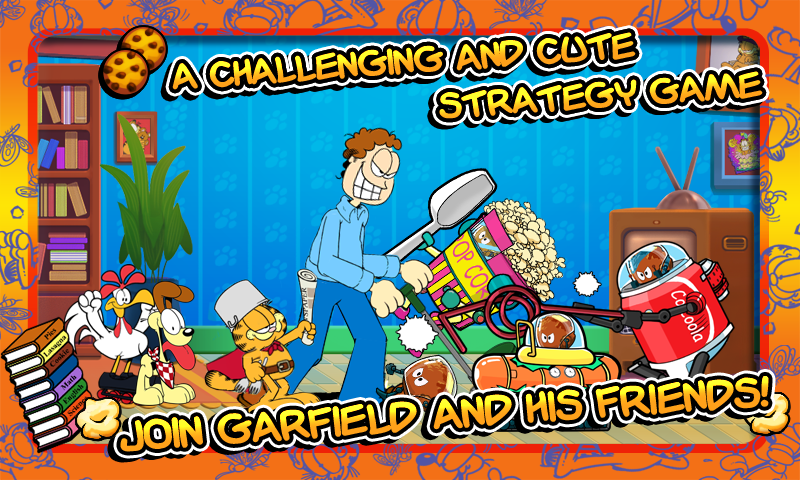 April 27, 2012 – Cat lovers rejoice: Garfield’s Defense: Attack of the Food Invaders is now available for Android devices! 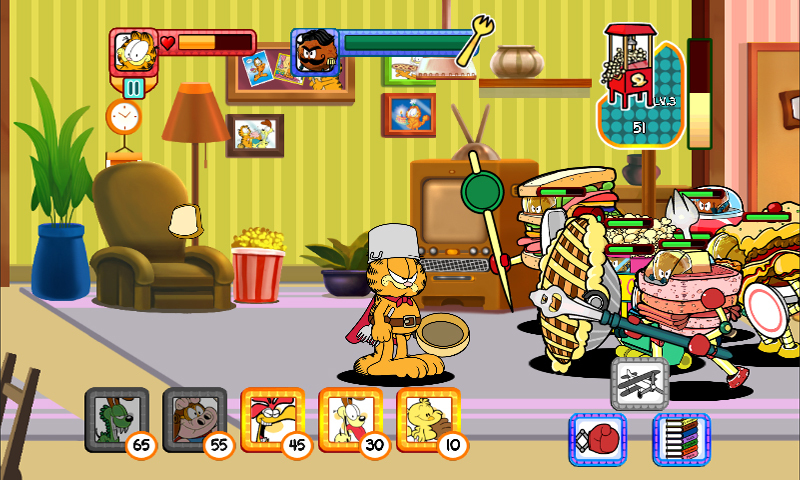 The brand new game app is an official Garfield product produced in collaboration with and authorized by Garfield creator Jim Davis and Paws, Inc. Download it free of charge on Amazon’s Appstore at http://www.amazon.com/Garfields-Defense-Attack-Food-Invaders/dp/B007VCVCAM/. Coming soon to Google Play and Apple iTunes. In Garfield’s Defense: Attack of the Food Invaders, extraterrestrials have invaded Garfield and Jon’s home to steal all the food and convert it into tasty-looking weapons. The aliens resemble ridiculous meatballs, but the threat is no laughing matter. Fortunately, the invaders may have bitten off more than they can chew, because the world’s most famous fat cat will never allow a single scrap of innocent lasagna to fall in the wrong hands. 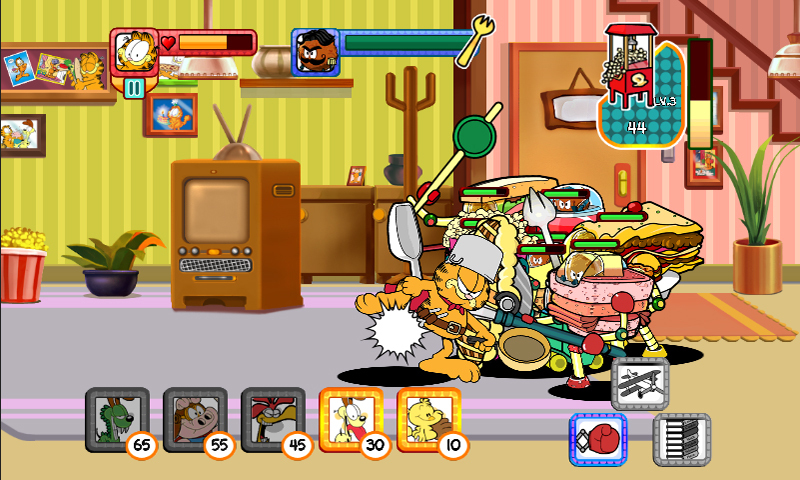 Players control Garfield himself, leading the domestic defense in dashing armor – an inverted pot – while armed to the teeth with frying pans, rolled-up newspapers, forks, and more. Garfield’s army includes various characters from the Garfield comic strip and TV series including slobbering sidekick Odie, Nermal the cute kitten, Wade the duck, Garfield’s girlfriend Arlene, Squeak the friendly mouse, and many more including (of course) Garfield’s owner Jon Arbuckle. All characters possess special abilities, strengths and weaknesses. Players can upgrade any character and forge an invincible fighting force able to repel the assaults of the evil Food Invaders and safeguard the integrity of the refrigerator. 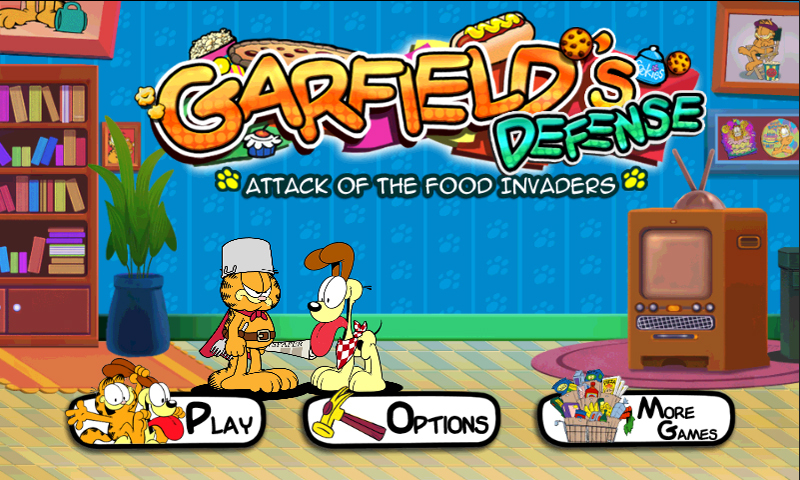 Garfield’s Defense: Attack of the Food Invaders combines tower and siege defense as well as combat game styles into an epic action-strategy title boasting gorgeous cartoon graphics that jumped straight out of the original comic strips and are fully backed by official Garfield licensor Paws, Inc. 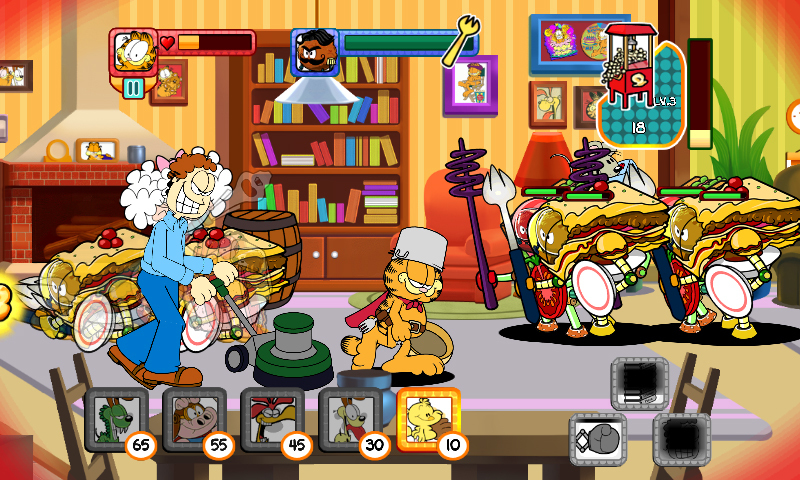 Play Garfield’s Defense: Attack of the Food Invaders to see Garfield at his most noble and majestic… OK, not really. He’s still as lazy and mischievous a scoundrel as you remember him, but now you get to join him in a desperate last stand to protect Jon’s fridge from zany alien attackers. For lasagna! 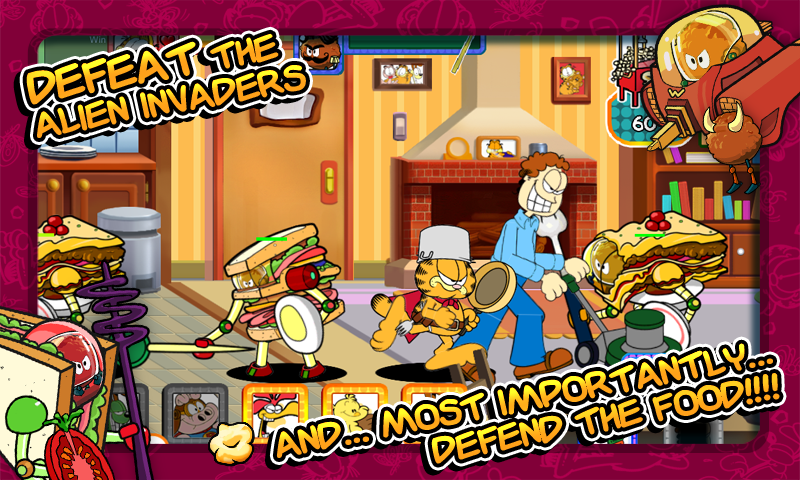 Garfield’s Defense: Attack of the Food Invaders is available free of charge exclusively on Amazon’s Appstore at http://www.amazon.com/Garfields-Defense-Attack-Food-Invaders/dp/B007VCVCAM/. Android 2.0.1 or later is required to play this title. The game will be available on Google Play in May 2012 and will be launched for iOS later in the year.